This is a lovely dark rose rhodochrosite crystal pendant. You will surely love its dark rose color. It is part of a whole crystal. The pendant including the bail is 2" and the chain is 18". 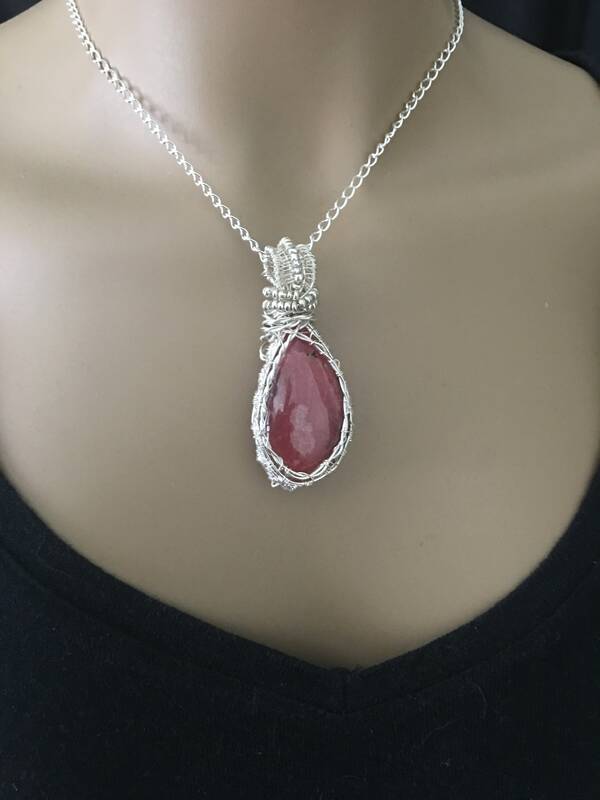 It is made with woven sterling wire and hangs from a sterling chain. 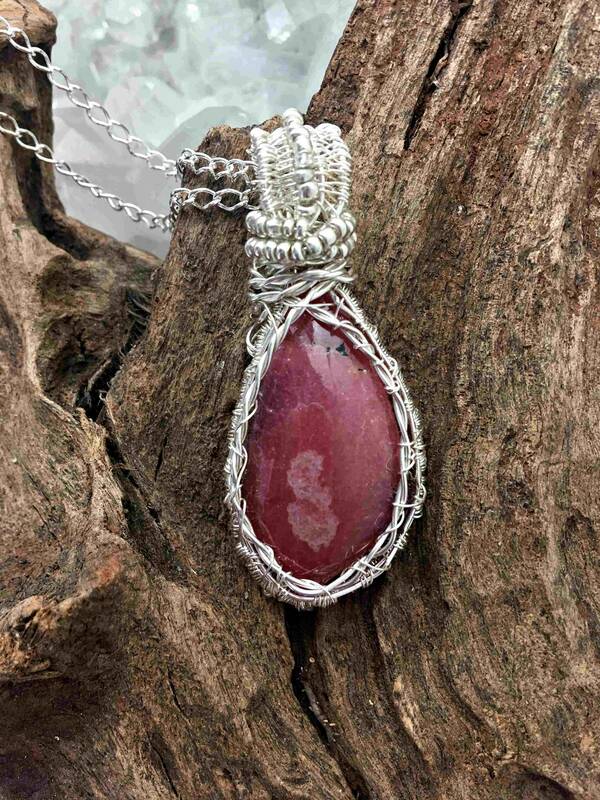 Wearing, carrying or meditating with Rhodochrosite helps make one buoyant and cheerful, dynamic and active. It is mentally enlivening, stimulating one’s creativity, dream states and sense of personal power. It allows for spontaneous expression of feelings, and can enhance passion and sexuality. Rhodochrosite reflects the Light of the heart and love, and stimulates the Heart Chakra. The Heart Chakra is located near the center of the breastbone and regulates our interaction with the external world and controls what we embrace and what we resist. It gives us the balancing ability to be ourselves within the environment, and helps in our relationships. Rhodochrosite’s task is also to clear and activate the Solar Plexus Chakra, the energy distribution center and the chakra of relationships. This chakra is located between the ribcage and navel, and controls the immune and digestive systems. When balanced physically, we have strength to fight infections, are free of allergic reactions, and are able to use the nutrients we ingest. When the Solar Plexus is out of balance spiritually, we feel fear - of the disappointment or displeasure of others, or to subordinating our life and pleasures to the will of others. Spiritually, when the Solar Plexus is in balance we are free to interpret the world through our own thoughts and emotions and not live in fear of violating the dictums of others. 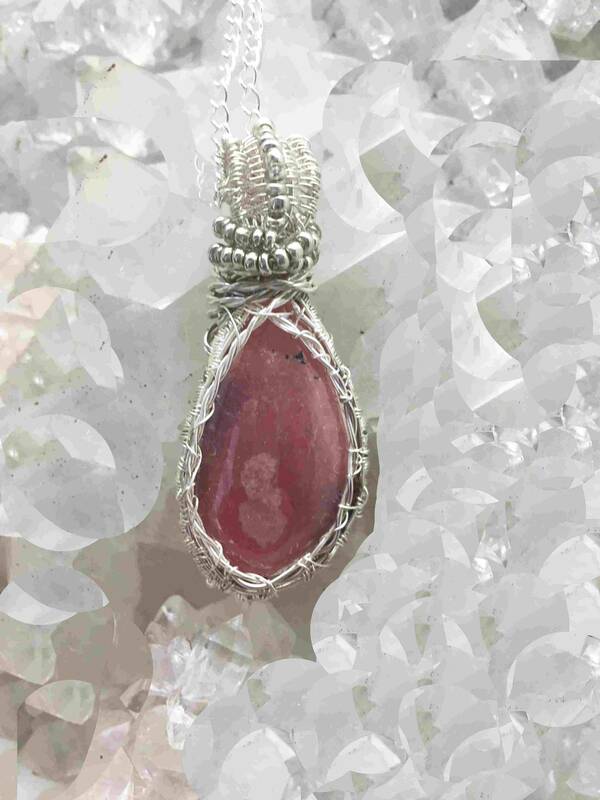 The Red color rays within Rhodochrosite bring a self-confidence built on fearlessness, a call to action and excitement. They raise our enthusiasm and speeds up our metabolism. Red reflects the color of passion, energy, and life. Pink Rhodochrosite brings the subtle, more feminine energy rays of determination, commitment, and caring. The soothing color calms feelings of anger or resentment, and can aid efforts to meditate and reflect. Pink is the color of new love, new romance and new relationships. It increases developing sensuality, and can help overcome heartache, improving our caring and loving abilities. The pale peach or Light Orange influence in Rhodochrosite promotes companionship and affection, bringing joy and friendship, pleasure, and family togetherness. It is a happy and sharing energy, integrating the parts of our communal lives, and encourages physical pleasure and intimacy. Rhodochrosite is ideal for connecting with the Archangels Auriel, Chamuel, and Tzaphkiel. [Lembo, 298] If your birthday falls in any of the following periods, a Rhodochrosite of the color listed can be a valuable conduit to your Guardian Angel. The table also provides the name of the Guardian Angel of those born in the time period.